The plain white facade of the Clifton Park Center is about to be blasted away. Clifton Park Town Supervisor Phil Barrett said, "The mall has had just a series of setbacks, and now we need a series of comebacks, and that's where we are." Most of the commentary about the current conditions of the Mall seemed very accurate. I found that the walking distances from one section of the mall to another section was a nuisance, and would be even if the mall was filled to capacity. I am sure that this does not help with making the mall appealing for patrons. Many of the stores are empty, however there are still some Decent stores remaining in the building. These include: Boscov's, JC Penney, Marshalls, Rex, Radio Shack, Aeropostale, FYE, Bath & Body Works, among others. All were slow with business, and were happy to assist you in any way upon entering. In fact, when I went into Radio Shack, I was asked if I was looking for anything in particular, and I replied "No, just passing time." The associate responded "Aren't we all." Many of the empty store fronts were walled up, with a message promising new and exciting stores yet to come in this location. For a Friday Afternoon/Evening, the mall was practically deserted. As far as the appearance of the store, I felt that both the mall Exterior and Interior were in good condition and fairly well maintained. The interior was well lit, and spacious, and attractive. I am not sure if this is enough to revive the mall, but the mall wasn't as bad as I expected it to be. Gaining more strong tenants will help. Only time will tell. I too am from the Capital District! In fact, my Dad was born and raised in Hudson Falls, right in your neck of the woods. I was born at Albany Med, and spent all of my first 18 years in Clifton Park. Specifically, I'm from Vischer Ferry. I was 10 or 11 when the Clifton Country Mall opened. (CCM) At the time, it was anchored by a JCPenney, which you mentioned, and a defunct Schenectady-based chain, Carl's. There was no Caldor or Stienbach at the time. There was also an A&P Market; that became a Price Chopper once A&P went under. I believed that they closed that one when the Price Chopper megastore went in across Rte 146. The suburban era of Clifton Park effectively begins in 1962 with I-87 (Adirondack Northway) reaching exit 9. My family moved to CP that year, from Albany, and in CP my father remains. (My 3 siblings and I are safely scattered across the United States) The striking thing is that prior to 1976-77, there was almost no retail in CP, even though the developments were spring up like mushrooms on a cow patty. By 1976-77, there were likely 30 to 40K people in CP, not counting surrounding townships, Half Moon et.al. My early retail memories are of packing into the 1972 Ford LTD station wagon and going to Latham Circle, Mohawk Mall, and Colonie center. There was literally nowhere to shop in CP. Oh yeah, a Barkers, that became a Joy, (Think of both as a lower class Kmart) that is now an RV dealer, opened in 1974 or there about. CCM got off to a patchy start. They had a fairly hard time getting the initial stores in. There were lots of big blank sheet rocked openings for several years. Once the mall was fairly well populated, the turnover began almost as quickly. There were a couple of small bookshops that quickly went under. Waldenbooks went in early, and seemed to always do pretty well. There was literally a constantly changing roster of small seemingly pointless shops that opened and closed: The Nut Factory, The Country Store, Etc. I can't recall them all, nor would there be any purpose. One that was not pointless, and was a big early success, was the Electric Circuit, the first video game arcade I ever experienced. It opened in the salad days of early video games. IN the very early years, the arcade had a fair number of electro-mechanical games, including torpedo shooting machines, and a anti-aircraft projection theatre thing. I could never afford that one, it was 50cents a play. All of the Pinball machines were electro mechanical. In a short time, There were defender, space invaders, missile command, arkinoid, Galaxian, etc. Perhaps I remember this place pretty well, because my parents would give a very tight quarter supply, so I never played that many games. I was also a very mediocre player. The Electric Circuit was up near where the CVS and the bank were. When I was a junior or senior in High School, 84-85, CCM added the the wing where the theatres are. They were taken over by Hoyts shortly after they opened. (they may have been hoyts from the beginning. The wing was put on the underside of the |_|It was in the wing that the first, uninspired, food court went in. The Electric Circuit was moved from its original location to the food court area. The space really sucked. It was a long bowling alley space. By that time, the arcade had become populated by lots of seedy characters. It was in that wing that the Caldor was opened, circa 1985. They then built the Boscov's wing off of that wing sometime later. A critique of the layout: By building out, instead of up, I think that the Mall designer made two critical mistakes. 1) they reduced the sense of liveliness in the mall. There could be lots happening in one wing of the mall, and the other side, literally .75 miles away, could be dead. If they had stacked it, a al crossgates or colonie center, there would have been much more of a sense of something happening. 2) They reduced parking, and in general messed up traffic flow. In addition to the addition to CCM circa 1985, the giant Clifton Commons, to the North side of 146, was under construction then. I remember the giant tracks of sand leading to the site. Once that opened, I think that CP went pretty much from being under retailed, to over-retailed. For CCM, the opening of the Mega Chopper probably meant that many people were pulled to the Commons, instead of CCM. The Mega Chopper had a much greater selection of stuff then the smaller A&P store. To make matters worse, by the time I finished college, there had been another big box mall built with a Hechingers as an anchor East of I-87. But perhaps the big killer of CCM was the big wounder of Colonie Center also: Crossgates. That thing was completed by 1984 or so. From that point on, my family and friends rarely went to CCM. Crossgates being located at the intersection of I-90 and I-87, it had a huge location advantage. It was just about as quick to go South on I-87 from CP as it was to go over suburban arterials to CCM. CCM was also always pretty much the ugliest mall that I had ever seen. My older siblings had said so from the start. After living around the country and seeing a wide variety of malls, I fully agree. The fit and finish has always sucked. Despite some "re-development" the new tile, planters and ersatz-street furniture could not gussy up a mall that was a poorly executed brutalist gestalt from day 1. Additionally, CCM had always had pretty middle brow stores, JC Penney, to the icky, Chess King. Colonie Center and Crossgates always had a better set of stores, particularly Macy's at Colonie (I believe the first Macy's outside of Metro NYC). I would say the 1985 or so is the pivotal year for CP. That is also the time frame in which the very last of the farms, including Kettel's, were sold out and plowed under, and CP became like every other souless sprawlburb in the US. When I was in high school, I definitely had the sense of CP being a pretty rural place. By the time that I finished college, CP definitely felt built out. Though there are brand new developments on the way. It was also in 1985 that the fate of the pioneering and tacky CCM was likely sealed. Look for a new parking lot there sometime soon, a la Mohawk Mall. Auto Mall anyone? New paint, new anchor, and a new name (Clifton Park Center), only time will tell the fate of this mall. I don't know much about the history of this mall, I don't know when it was built, and I don't know who owns it. I do know it was originally anchored by the now defunct Stienbach and Caldor chains, as well as JCPenney and Marshalls. I also know, that aside from the addition of a Boscov's department store in the summer of 2000, the occupancy of the mall still remains rather sparse. This mall housed a Caldor that didn't close until the very end of the chain, which means it was a well preforming store, a fact that says something for the mall. This mall has a food court, with nothing that I really would want to eat in it. It has patches of success in the mall, (Near the main entrance, and the east side of the food court) but getting traditional mall tenants has been hard for this struggling mall. 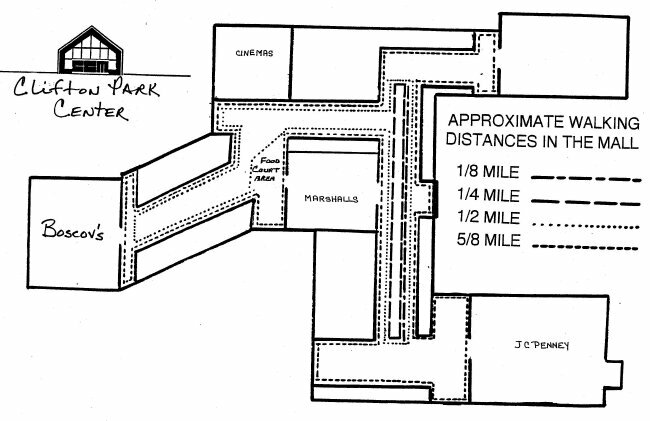 The corridors leading to the JCPenney have no stores as well as the hallway in front of the former Stienbach, and things aren't looking much better heading over to Boscov's. Marshalls does well, but they seem to do well anywhere (I.E. Mohawk Mall, where their customers have to walk through filth just to shop in the store). I want to talk to the CEO of Marshalls, he must be a genius, because they only leave a location if the lease isn't renewed. High profit margin I guess. The Mall's CVS store left fairly recently in favor of a newly built 24 hour pharmacy across the street, and some of their medium spaces are occupied by a 2nd hand CD store and a flea/antique market. Interesting archetecture at the Marshall's Mega Store... you can access it from inside the mall at 2 totally seperate locations. That's hard to find. Boscov's seems to be doing well for itself, but hasn't been successful at breathing new life into the "Clifton Park Center". Despite some meager attempts to change this mall's image, it's still teetering on the brink of being catergorized as a dead mall. If you walk through the hallways, you'll notice that the background music is too loud, which I suppose is to eliminate that eerie silence you get when no one else is around. CPC is swimming with a cinder block tied to it's ankle. From the Clifton Park G.O.P. BOSCOV'S OPENS TO RAVE REVIEWS! The new Boscov's Department Store has opened at Clifton Park Center to rave reviews. This beautiful facility, which was built in record time according to Boscov's management, has completely changed the atmosphere and vitality of the Center. Boscov's Store Manager Jay Janowitz said that the interest and enthusiasm of shoppers has been overwhelmingly positive, and that the initial Grand Opening has been among the most successful in the company's long history. Town Supervisor Phil Barrett, who spearheaded the campaign to bring Boscov's to Clifton Park, was very pleased. "This is a tremendous boost to not only the citizens of our town, but to all of Southern Saratoga County" said Barrett. "Not only does this revive the Mall, but it enhances the quality of life here in a very real way. For example, now people don't have to drive to Colonie or Wilton to shop at a modern, full range department store. And the increased sales tax revenues will also significantly help our town". Center Manager Fred Miller is optimistic that additional stores will be locating to the Center during 2001. He says that he is in negotiations with several companies who are eyeing the Center now that Boscov's has opened so successfully. Clifton Country Mall in Clifton Park has changed its name to Clifton Park Center to reflect the mall's new image. Mall management is determined to take advantage of the increase in prestige and in shoppers from the new Boscov's department store. The name change is a way to distance the mall from its former problems, said Fred Miller, the mall's manager. Philip Barrett, Clifton Park town supervisor, organized an e-mail campaign for town residents to actively lobby Boscov's to choose Clifton Park. The company last year had narrowed its choices to the Clifton Park mall or the Wilton Mall in Wilton. Boscov's also has a store in Colonie Center in Colonie. Miller said the new Boscov's is doing "tremendous business," better than the mall and the company expected. Miller said the mall has completed exterior renovations, including an upgrade of the mall's facade and a repaved parking lot. Mall management is now working on interior changes including a new color scheme and updated lighting.